Attack. Not isolated. Fate of Americans unknown. Amy is watching TV when it happens, when the world is attacked by Them. These vile creatures are rapidly devouring mankind. Most of the population is overtaken, but Amy manages to survive—and even rescue “Baby,” a toddler she finds in an abandoned supermarket. Marooned in Amy’s house, the girls do everything they can to survive—and avoid Them at all costs. Post Apocalyptic Science Fiction for the win. That is all that really needs to be said about this one. Demitria Lunetta has written an absolutely win of a novel with In the After and I already cannot wait to read another book from her! In the After was intense, scary, and brought out all the feels. The plot sped right along and I wanted the book to never end! Amy is one awesome character - she is so strong and I loved seeing how things panned out for her. Basically you need to be rushing out and picking this one up ASAP. So much goodness is going on her - I cannot wait for another read from this debut author! Amy was home alone, watching TV, having a day very similar to many other days. Except this was the day that They attacked. Creatures who are devouring anyone They find and the best way to stay alive is to stay silent and stay inside. Amy ventures out only when necessary and on one of these trips she finds a toddler she names “Baby”. Together they stay in Amy’s protected house for years. Then, miraculously, they’re saved and taken to New Hope, a safe shelter from Them. But Amy’s not convinced it’s the sanctuary everyone says it is and she refuses to let New Hope take Baby away from her. I was in the mood for a creepy read and this one seemed to be a good choice after looking through my shelves. It looked creepy but also different, definitely what I was in the mood to read because I ended up really enjoying it. Amy was a character I could relate to quite easily. She was young, a bit spoiled, not someone most people would expect to be able to survive on her own, especially not in the world in this book. She was lucky that the house she lived in was protected but in order to survive, she had to learn how to avoid Them, how to safely scavenge for food, how to defend her home, herself, and Baby. She had to become hardened but she still had her soft moments, rescuing Baby was proof of that. She had really good instinct so when she felt something was off about New Hope, I went with her. The book was mainly two parts. Amy, and then Baby, surviving in their house by themselves, relying on themselves, doing whatever was necessary. The second part was them in New Hope, trying to adjust to a society again, learning how to feel safe and to trust more than just each other. Both parts were interesting since they offered different challenges but the second part with New Hope edged out the beginning for my favourite. It was fascinating to see people trying to fit back into society after surviving on their own for so long and how maybe it wasn’t possible for everyone to adjust. There were some surprising twists in the plot and some twists that I thought were a little predictable. The overall storytelling was very strong. I had a nice sense of the world, both Amy’s house and New Hope, and what was happening the whole time. The writing was dark and gritty and really fit the whole plot well. This was definitely right the choice to fit my need for a dark, creepy read mood. Wow! This book is amazing. In the After (after the aliens invaded earth) Amy lives in complete silence with a mute toddler she names Baby. Neither of the girls speak, they walk around without shoes, and they don’t go out during the day. Because if either of them makes the slightest sound, They will come. And They eat people, bones and all. They’re fast and single-minded, driven only by their desire for food. Basically, if one spots you, you have more or less no chance of escaping. It’s terrifying! I scared myself so much reading this, and it made me aware of every little sound around me. This is one of the best post-apocalyptic worlds I have ever read, and at times reminded me of THE WALKING DEAD, which I LOVE. Extra points! 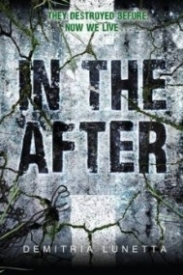 IN THE AFTER is clever and unpredictable and I’m so ready for the sequel. In the After, the debut novel, by Demitria Lunetta is stunning, terrifying and completely thrilling. Amy is stuck at home while both her parents are out when the world is attacked and her life is turned upside down. She has to learn how to relive her life so she can survive these new beings. At first, she has glimpses to the outside world and then the television goes. And then she runs out of food, and has to make changes to the life she knew without being killed by Them. The suspense in this book felt real. At first, I thought things would be super cheesy- especially with a character named Baby. But no, I was genuinely intrigued and pulled into the world Demitria created. Every scene felt so believable, so much that I was there. Until Amy came to New Hope. I had SO many questions. I needed to more about the background of this place. This could be a great stand alone, but I’m hoping there’s more. I need more answers as to how things got the way they did. I need to know more about Amy’s mom and Baby too! Overall, this was a great debut book and even though it left me thirsty for more, it was a satisfying read filled with all the great elements of a dystopian. Where to begin with the awesome that is this book? The synopsis doesn't define Them so I was just kind of assuming They were zombies. Now, I love me some zombies (like, for reals, I'll take zombies over faeries/vampires/werewolves/etc. any day), but I'm loving something even more these days: aliens. Sadly, aliens are so very rarely done well. I was super disappointed when I found out the aliens were as cliche as they could get: two arms, two legs, green. The only cool thing was there crazy sharp teeth. To be fair, though, by the end I was perfectly content with their appearance, intrigued even. I like Amy. She's a great character. The love she feels for Baby is amazing. Sure, sometimes it makes her a little too single-minded, but it's a good and realistic flaw. I also really like that she talks about how she really broke down in the beginning, but ended up pulling it together and not only taking care of herself, but a toddler as well. When she and Baby are taken to New Hope, she's always wary, but wants to believe in it. I like that, unlike a lot of post-apoc and dystopian MCs she stays alert, but also really wants to believe she's found a home and a new life. Really, a lot of characters deserve a shout-out because Demitria did a great job at giving the side characters personality, but I want to focus on Baby. I was a little how much I'd enjoy a book with such a young character playing a major role, but I loved her. First of all, the synopsis led me to believe Amy was going to be packing around this squealing, drooling baby in the post-apocalypse, but Baby's actually somewhere around 6. So instead of just being this weird extension of Amy, she has her own personality. She loves Amy fiercely, and relies on her, but she can also take care of herself. I mean, Amy didn't even find her until about a year, or something like that, into the After. This tiny kid managed to live with carnivorous monsters on the loose all by herself. That's pretty freaking awesome. The Nutshell: In the After was everything I want in a apocalypse/post-apoc/dystopian book. There's some alien action, some evil humans (or at least one really evil one), just the beginnings of a romance so it wasn't all used up in book 1 leaving book 2 out in the cold, plenty of suspense, and, you know, quite a lot of death, albeit most of it anonymous. I feel left out in the way that everyone else seems to love this book. Did I like this book? Yes. Did I love it? No. Shows how Amy survived "the After" so far and how she discovered Baby (A little girl). I enjoyed this part. I liked hearing about how Amy survived this new world and how she and Baby became sisters to each other. While reading the first part, I thought I just discovered a new favorite. Part two is much larger than part one. This part takes place after the rescue and it shows how life is in the utopia of New Hope. This part also switches in a way that it shows what is happening "presently", after the rescue, and what will happen in the future. I found this really interesting. I kept flipping the pages because I had to know howAmy got to that point! What made me not enjoy the 2nd part is hard to tell. Was it the predictability? The dragging on? Maybe a little bit of both. Another thing that I would like to mention is that there is a "romance". I put that in quotations because I was never quite sure if the feelings were of the romantic type. There was one kiss and then there's absolutely no mention of it again and no hint of anymore romance. I just think that it might have been better if there was no "romance". I actually did enjoy most of the book but I just couldn't put myself to like the 2nd part. I will be continuing this series! I like a decent night’s sleep as much as anyone else. In fact, I can get downright surly when I’m deprived but I don’t mind in the least when it’s a book that’s keeping me up because, after all, that’s a pretty good sign the story is truly enthralling. That’s exactly what I would call In the After, enthralling. Post-apocalyptic and/or dystopian fiction is high on my list of favorites and I’m even happier when both subgenres are present which is the case here. There’s a very distinctive and abrupt shift from one to the other and also a shift in reading excitement, if you will, and that leads to the only reason I can’t give this a full 5 stars. Not only is there a shift in theme and intensity but there is also a drop in the effort spent in character development. Amy and Baby are two of my favorite characters in memory. They’re both so intelligent and they make the best of a terrible situation, learning as they go how to survive and do so in a fair amount of comfort. The love that develops between the two girls who become as sisters is natural and heartwarming and they each know that they can depend on the other without question. Would Amy have grown into such a strong and empathetic young woman if disaster hadn’t happened? There is no way to know but, if there is ever a bright side to an apocalyptic scenario, it’s in the ways that some people rise above their circumstances. On the other hand, there is Baby who is just a toddler when Amy finds her and, while she is preternaturally aware of how to protect herself, it is certainly unlikely that she would have survived long without an older companion. The two girls need each other and the payoff is huge. The second and third parts of the story are where I felt a lack. After pouring so much effort into helping the reader understand and care about Amy and Baby, character development of the new people in their lives is really pretty thin. I would have liked to know Vivian much better and, while I liked Rice to a certain extent, I also had some niggling doubt about him. Kay and Gareth are better defined but, again, I want to know more and, considering the ending, I can’t be sure I’ll get that in future volumes. Other characters are unlikable to varying degrees but, again, it would help to know more about them, why they are the way they are. The “event” is really not enough to excuse some of the behavior even though they certainly fit into the usual dystopian mold. Finally, the very lightweight romance felt to me like the author believed she had to throw it in and it really didn’t add anything to the overall story. It didn’t actually bother me but I could easily have done without it. Having said all that, I really did love this book—it’s scary, nail-biting, thought-provoking, heartwarming and different from the pack—and it did indeed keep me up all night ;) . Demitria Lunetta is a fine writer and I am going to have a hard time waiting for the next entry. The set-up is so creepy, I cannot imagine these aliens, Them. They are so strong, but Amy luckily finds their weaknesses and even though her parents don't survive, their eccentricities from life helps her to survive in this almost post-apocalyptic setting. At first Amy thinks she is alone, the last person alive, but then she finds Baby, and runs into people slowly. I loved the sisterly relationship between Amy and Baby, it kept me emotionally invested in the story while the encounters with Them, and the challenges of staying alive kept me involved with action and plot. I was eager to find out more about this strong alien, why they are there, and how they got there. How others besides Amy survived, and where this mysterious group of other survivors mentioned in the synopsis would come into play. Demitria Lunetta gives those answers little pieces at a time, and keeps me reading with her great world building and attention to detail. Its intense, a little gritty, and the pacing is great throughout. I enjoyed Amy's character, she is smart, snarky and resourceful. While she does what she has to in order to survive, she has a heart that is big and beautiful. She rescues Baby, and she takes in others. She still cares for others despite what she went through. The jumps in time starting around 30% confused me though. I know that was the point because we are in Amy's head and she obviously doesn't know what is going on either. When I started getting suspicions of why she was drugged and confused I didn't like it but I knew that it was all part of the storyline, and like a sucker punch to the gut. I didn't have it all right, but there were a few things I was right about and then other twists that caught me completely by surprise. There was a hint of romance, and I hope that the next book advances it a little more, but I am okay with that. It was kind of refreshing for that not to be a driving factor in the book. The ending is crazy, and all that it should have been for the book except that it was a bit of a cliffie but it left me yearning for the next book which I will definitely be reading.